I know some earlier commenters were let down by this flavor.... but to me, it's gorgeous. 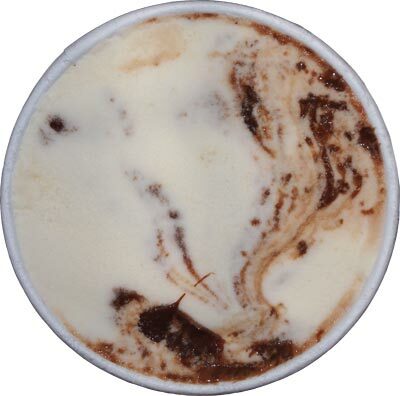 The wavy swirls, the big puddle of chocolate, I'm having trouble taking pictures instead of just shoving my face in to this pint. Breathe Dubba, just breathe. I delicately extract that chocolate puddle you see and sample.... funny, it almost tastes like coconut at first. I take some more bites and maybe people are upset because they weren't expecting this flavor profile. I mean, I don't know what I was expecting either. I just found another chocolate puddle and it tastes high ends, like someone melted those international chocolates that people always bring back from a business trip. The base is dense yet still soft. The flavor is.... well, wait, what does Tres Leches mean? Three milks? Oh, funny, Dulce de Leche is caramel, so foolish me thought this was a caramel base. Hehehehe. Learn something new everyday. It's nice though, a real high quality product. The flavor is mild so as to let the abundant swirls shine through. The melted edges are kind of fantastic. We're talking happy place kind of melted goodness here. I get why people might say it's simple, but you need to slow down and realize how clean this flavor is. It's not gummy or fake. It's just a wonderful ice cream breaking down on your taste buds. It's "simple", but it's excellence executed simply and I'm enjoying it more and more with every bite. Oh I forgot to take a picture didn't I? Sorry, this one will have to do. I got wrapped up in the moment. Yes, it's effectively vanilla fudge swirl, one of the most basic of ice cream flavors, but execution is spot on. If you don't believe me, just focus on eating the melted edges. Go slow and try to enjoy the aftertaste of every bite. We can do this people. We can remember what quality is. We don't need mix-ins. Remember your childhood! On Second Scoop: Mmmmmm, slow scooping the last third of the container. Savoring the flavor profile. Definitely buying this one again. Sounds like a flavor worth trying! It does look that way doesn't it? I think it's suppose to be chocolate covered Tres Leches cake though. It's a picture of a brigadeiro, which apparently is a Brazilian chocolate bonbon. 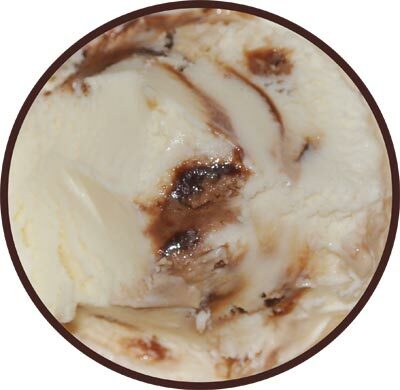 This particular ice cream flavor was developed through a collaboration with a bakery that makes these bonbons. Duh! 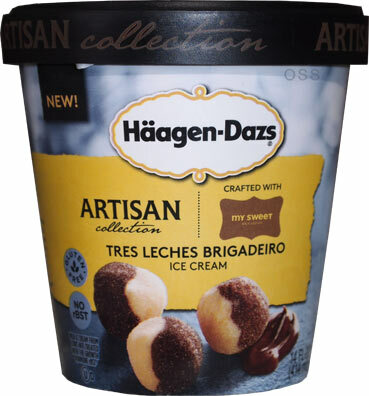 Yeah, I knew about the collaboration, but I didnt recognize the particular brigadeiro until I re-read the description on the side of the carton. I will add a pic to the review. My take on this flavor is that it's too mild. It's nowhere near as good as the Tres Leches Cake flavor that Haagen Dazs sold years ago. I don't think it particularly works as a Vanilla Fudge either. 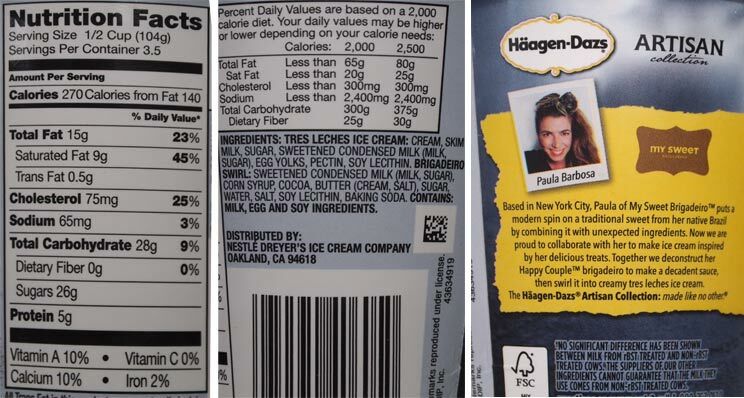 Haagen Dazs' discontinued Vanilla Fudge was much better. So far, I'm disappointed with the Artisan Collection. But then, I should not have expected much. It is called "Artisan Collection" after all. Jeez, how about a little originality, people. I saw this in my local grocery store tonight and was so tempted to try it. Held back until I could check the site for the review! I'm still on the fence about it. I love vanilla fudge but for some reason that's not what I thought it would be. This flavor is all the rave in South Florida, home to thousands of Brazilians, who are flocking to Target and local stores to get their hands on this one! The "tres leches" is the dominant flavor, and is not as sweet as the original desert, the "brigadeiro" is semi-sweet chocolate, and it has a somewhat bittersweet flavor that recalls chocolate drink mix powder (Nesquick or Nescau). I agree with Dubba. This is a complex and delicious flavor, despite its simplicity. I can't leave it alone (and I don't like vanilla ice cream with fudge sauce). Beautifully executed. I too thought, "hey--this has hazelnuts in it, gotta be good", but was actually disappointed in how very bland the flavor was. Will try another flavor next time. I think it is delicious! Quit over analyzing and enjoy. @LastAnon: you got one badly burnt pint of ice cream, where did you find it? if you can, reach towards back and grab a pint that is solid, not squishy. Also, look for signs of meltage on the flavor you are picking, it may have been shelved last and been out for a bit. It tasted like normal vanilla ice cream with chocolate sauce. Nothing special and expensive. I never buy HD but had a coupon for $2 off, so I picked this flavor of the Artisan lineup because it sounded the most appetizing. I think it was freezer burned at the store, so I'm sure it could be better, but the flavor is so subtle it's almost not there at all. It almost tastes like eating plain frozen cream swirled with bland chocolate sauce. It certainly doesn't taste artificial, but I wouldn't say it's delicious and I won't be buying it again. I'll stick with my Breyers Gelato. Very disappointed! The brigadeiro does not taste at all like brigadeiro. The chocolate swirls tasted just like Hershey chocolate sauce. PLEASE BRING IT BACK! I ABSOLUTELY LOVE THIS ICE CREAM AND AM CRAVING IT. Can I order it and have it shipped to me??? Sorry Unknown, but it's gone. I would scout your local store for any that's left and bury it at the bottom of a chest freezer to extend it's life.